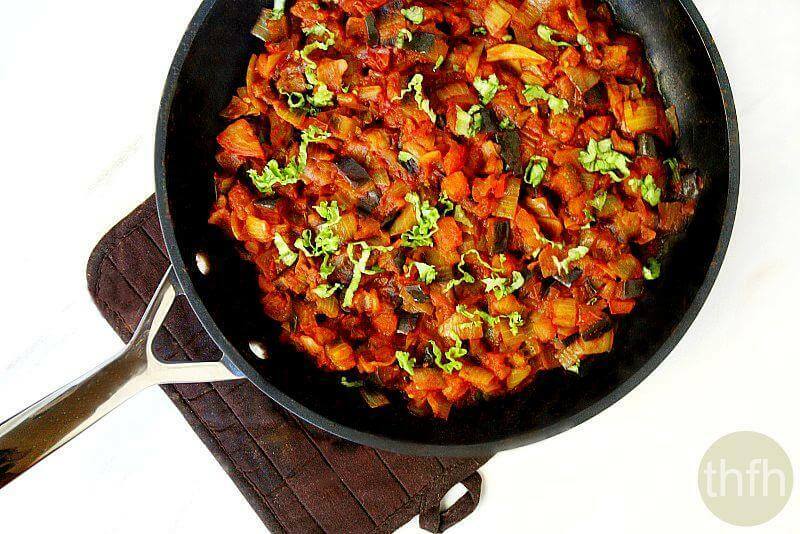 This Eggplant Tomato and Onion Stew is really simple to make with a minimal ingredient list, fresh veggies and it can be enjoyed plain or over quinoa, brown rice or even pasta. While visiting my parents, my dad requested that I make something for dinner with the eggplant he had just bought, so decided to make this dish since they had the rest of the simple ingredient list on hand. Not only did I make it for him that night, but he asked if I would make it again! So after making a grocery trip for more eggplant, I made it a second time for him before we left from our visit because he liked it so much and we had it twice it one week. It’s a “one-pot” meal and basically after dicing your fresh veggies and simmering them for about 20 minutes, it’s ready to enjoy. And not only is it a delicious meal to serve for “Meatless Mondays”, it’s also vegan, gluten-free, dairy-free and even paleo-friendly. Want more healthy meal and entree recipes? Check out Clean Eating Zucchini Boats with Creamy Garlic Sauce, Creamy Red Lentil and Kale Soup, Spicy Turmeric Twice Baked Potatoes or my Clean Eating Cookbook with an entire chapter of 20 healthy, clean eating recipes just like this one that you will love! **These statements have not been evaluated by the Food and Drug Administration. This information is not intended to diagnose, treat, cure or prevent any disease. Tip #1: In the photo above, I didn’t add the 1/2 cup of water listed in the recipe this time so it made a thicker stew. If you prefer a thicker stew, omit the 1/2 cup of water. If you prefer a thinner stew, add the 1/2 cup water. Tip #2: Adjust the Himalayan pink salt salt and cayenne pepper to your preference. Tip #3: I like to use organic tomato sauce in a jar to avoid canned tomato sauce (due to the BPA lined cans), but feel free to use your favorite brand tomato sauce. Tip #4: I like to use fresh tomatoes to avoid canned tomatoes (due to the BPA lined cans), but feel free to use canned diced tomatoes if you prefer. 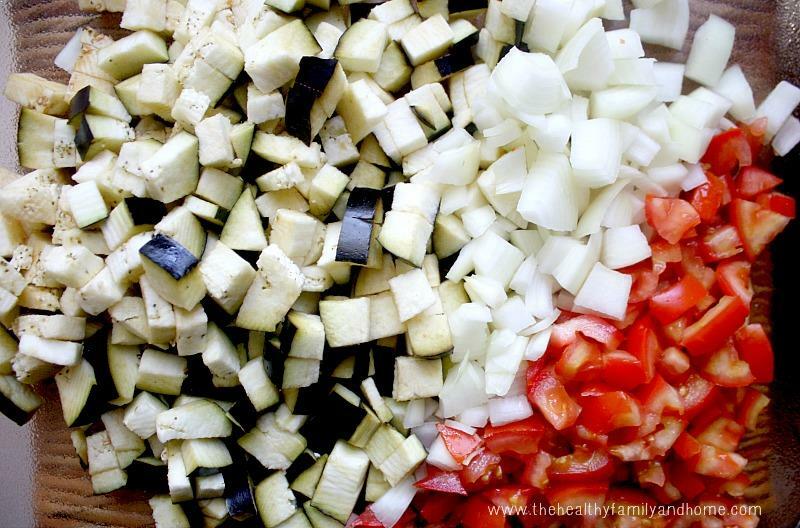 Step 1 Prepare the veggies: dice the unpeeled eggplant, tomatoes and onions into small pieces. Set aside. In a large saucepan or skillet, add the tomato sauce, cumin, pink himalayan salt, cayenne pepper and water and stir well. Add the veggies and bring to a boil. Reduce heat to simmer. 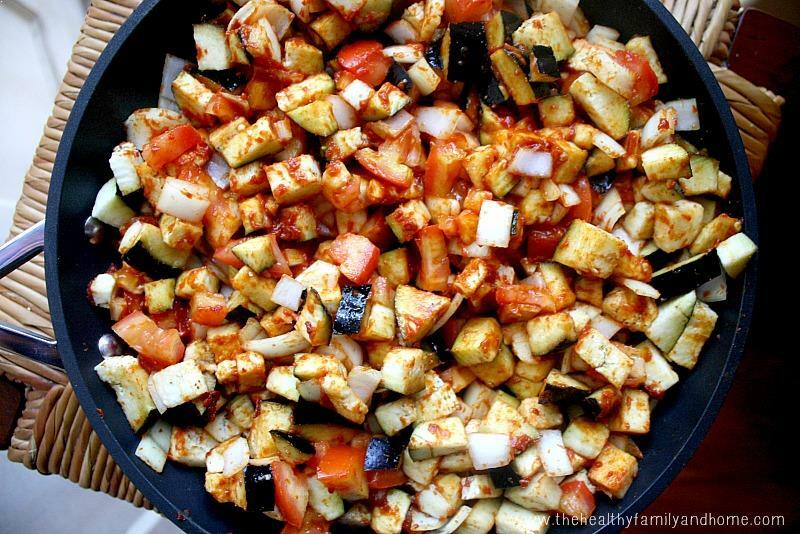 Cover and cook for 20 - 25 minutes or until the eggplant are tender. Add additional water if you want a thinner consistency. Serve plain or over quinoa, rice or your favorite grain. This recipe will make (4) small servings or (2) larger servings. The recipe and photographs for "Eggplant Onion and Tomato Stew" by Karielyn Tillman of The Healthy Family and Home are licensed under a Creative Commons Attribution-NonCommercial 4.0 International License and cannot be used without my written permission. Hi there Thomas! I usually use actual “tomato sauce” like this —> https://bit.ly/2y4Malg. But if you don’t have any, I would substitute tomato paste like this —> https://bit.ly/2wvY2LV (just add some extra water to thin it out) or a can of chopped tomatoes like this —> https://bit.ly/2juP5Bv (include the liquid in the can, don’t drain). But I, personally, wouldn’t use pasta sauce as the seasonings might affect the flavor – unless you want an Italian flavored stew (which actually sounds good!). Hi do you know if this freezes well? Thanks! Hi there Anne! I’m not really sure about freezing it, I’ve never tried to do it before. The next time I make it I will freeze a little to test it out and report back. I don’t see the recipe. you mentioned not using tomato paste- but I am unclear how I can substitute for this. I prefer everything to be homemade, so do I just use diced tomatoes? and how much? thanks! Hi there Sue! You could omit the tomato paste and use additional diced tomatoes which would work to give it the “tomato-ey” flavor. I would add an extra 1 cup of diced tomatoes to substitute the 8 ounces of tomato paste. Try it raw! Sort of sweet, and would make great crudités! It’s so funny how people get about eggplant but quickly become addicted to its vegetable-gray goodness. This looks absolutely amazing! Hi Hanna! I know exactly what you mean! I used to hate eggplant and not even because I had tasted it and didn’t like it…I just decided I didn’t like it because of it’s appearance lol!